You're on your own lighting the candles and picking mood music, but we've got the dinner part of your next dinner date covered. Save up to 58% on Blue Apron at Escapist Deals. Blue Apron takes all the frustration out of cooking a meal, while still leaving all the fun stuff to you. Skip the trip to the grocery store and hours spent looking for the best recipe - Blue Apron will send you pre-portioned ingredients for every meal, along with a recipe that'll take you through every step. (Trust us, you'll nail the recipe even if it's the first time you're turning on your stove.) Get farm-fresh produce, antibiotic-free meat, and sustainable seafood, all in healthy, 500-800 calorie portions. Get cooking. 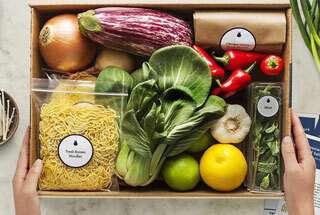 Get three Blue Apron meals for two people for $25 or two meals for four people for $33.